I am a big believer of to do lists. Write it down and CROSS IT OFF especially during this time of year. I have saved this post from Maria Kalman of the New York Times titled CAN DO. It is a little story about Benjamin Franklin. Maria writes, He believed in doing good everyday. He made charts and had daily goals. 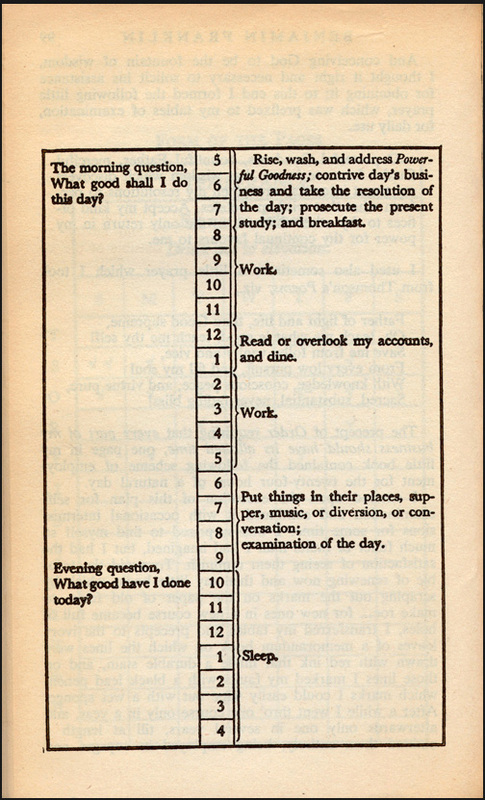 The picture below is his daily schedule. He saw a dirty street and created a sanitation dept. He saw a house on fire and created a fire dept. He saw sick people and founded a hospital. Read all of maria’s post here. I will keep this post short and get back to work on my mother’s day gift, oops I mean Quilt Market. 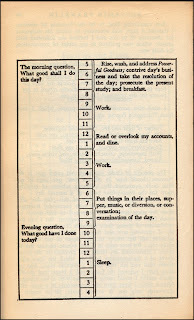 The moral to Maria’s blog post and mine also is time is relative, especially when you consider what you do with your time and what Ben Franklin did with his. Go out there and create something great! See you in Salt Lake with all your greatness. One quick side bar- Don’t ever write down all your UFO’s (unfinished quilt projects) on a piece of paper titled TO DO: and post it by your sewing machine. Great post! You are so right about time being relative. We can never do everything we WANT to do in this lifetime, but every day we can do SOMETHING worthwhile. I'll be at HMQS in Salt Lake in May in the QOV booth(Thursday morning). Come by and say hi! Okay you scared me a bit with the mothers' day right after Easter …. thank you for the clarification! 🙂 I really laughed, though, at your last comment, or rather, your husband's 🙂 Happy stitching!! just last night I sat down and planned my week from 5am til about 7pm Mon-Fri and its 7:45am so far so good. I remember reading a bout Ben Franklin and his list. Thanks for the confirmation that I'm starting this week off right. I have a list…got two quilts checked off in the last week…so glad it's spring break this week, so I can get lots done. Thanks for the reminder about Mother's Day…I've been so focused on Quilt Market it wasn't even on the radar! I will definitely take your advice on the UFO list, too! Hope to meet you in Salt Lake! i can't believe we both wrote about lists! of course yours was about getting things done, mine was about how to avoid getting things done! too funny. I love love Maira and the way she tells a story is so engaging. Her husband Tibor was like that too. A while back i had the fortunate chance to go to a talk given by Tibor at Cooper Union. He was such an inspirational voice with a clear and unique vision and witty humor that was ticklish and contagious. He died only a short while after this talk. Such a loss to the design world. I've always been really thankful that i put work aside and went to hear him.